The Sun's front page this morning alleges that Queen Elizabeth favours the UK exiting from the EU. Will the story prove to be a storm in a royal teacup, or could 'Elexzit' help sway the referendum vote on 23 June? We ask PR pros. Hold the front page: Will The Sun story impact the EU campaigns? 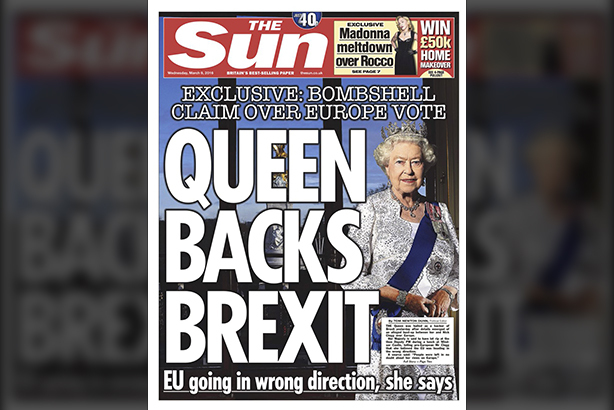 Under the headline "Queen Backs Brexit", The Sun this morning quotes two anonymous sources who suggest the monarch has expressed concerns about the UK in Europe. One was reportedly made to Nick Clegg in 2011 during lunch at Windsor Castle, when, according to the newspaper, she made it clear to the then-deputy PM that the EU was "heading in the wrong direction". According to The Sun, the monarch also "revealed her Eurosceptic feelings" during a separate conversation with MPs at a Buckingham Palace reception. She reportedly said: "I don’t understand Europe." Both the Royal Family and the Liberal Democrats have distanced themselves from the alleged incidents. In a statement, Buckingham Palace said: "The Queen remains politically neutral, as she has for 63 years. We would never comment on spurious, anonymously sourced claims. The referendum will be a matter for the British people." Mark Borkowski, founder of Borkowski.do, suggests that the impact of the story could be far reaching as the referendum debate hots up. "Queen Elizabeth is a canny one. She always picks the winning side. She’s successfully backed Scottish Union twice. Her horses have won over 1,600 races. She came round to the Diana mania with grace and an Oscar via Dame Helen. "No one trusts the polls. If there’s any reliable barometer of public sentiment it’s the signals that are smuggled out the Palace amid denial and reaffirmations of neutrality. "Forget BoGo [Boris Johnson's backing of Brexit]; Elexzit is something that should slash the bookies’ odds. "It doesn’t matter what her real view is: officially she doesn’t have one. The 'remainers' will not be satisfied with a denial - 99 per cent of Palace statements are denials. They will want to leak the Queen’s 'real' pro-EU views. This will of course be denied and neutrality will be reaffirmed. Whatever the outcome of the referendum the Queen will have backed the winning side - because she’s claimed by both. A canny one, Elizabeth." However, other PR professionals have downplayed the long term impact. PLMR managing director Kevin Craig said: "Today's splash in The Sun is the latest in that newspaper's proud history of bold front pages - but the headline isn't backed up by what's in the copy itself. "Cynics would argue that this is a desperate move from a heavily Eurosceptic newspaper, as the 'out' campaign has been overhauled in the polls in the last fortnight. "Buckingham Palace has insisted the Queen remains 'politically neutral'. Anything else would be a totally unprecedented move. So the 'in' campaign will say they are not unduly worried about this, and can echo the Clegg response - 'this is nonsense'. Ed Davey was also strident on the Today programme in dismissing this as a 'Freddie Starr ate my hamster story'. "I would expect the story to give a short-term boost to the 'out' campaign, but the referendum is still over three months away, and I doubt it will have a significant impact on the final result." Darren Young, director, corporate, technology & public affairs at Ketchum, said: "Some say the last days of the Scottish referendum were swayed by speculation on the Queen’s supposed views. So it shouldn’t be a huge surprise that a story about the monarch’s EU opinions should surface in this debate." He said the timing "isn’t ideal" for the Prime Minister and Chancellor as it knocks out of the headlines the recent comments from Mark Carney; yesterday the Bank of England governor told MPs that the prospect of Brexit is the "biggest domestic risk to financial stability". But Young added: "The Sun story is unlikely to have any genuine impact given its anonymous sources, the unequivocal rebuttal from Nick Clegg, and the fact that most people genuinely won’t make their mind up till just before voting day. "Expect speculation on the Royal’s opinions to pop up a few more times between now and June." Gill Morris, executive chairman of Connect Communications, said: "This must be one of the most sensational Sun headlines since 'Freddie Star ate my hamster' and equally unlikely. "In her 90th year, the last thing the Queen will want to do is hasten a Brexit or hasten the potential break-up of her beloved United Kingdom. It will be amusing to watch how Nigel Farage plays this but I think most will see this as pure sensationalism and if anything I think it will boost the case that remaining in Europe is the better option for Queen and country." Rhoda Macdonald, director at Hanover, said: "This is a non-story and has more than a hint of desperation about it from the 'leave' campaign. Both parties, Her Royal Highness and Nick Clegg, have dismissed the claims as nonsense. Sensationalism such as this does no credit to either side of the campaign." The EU referendum continues to dominate the political news agenda in the UK. Yesterday the British Chambers of Commerce issued a second statement to clarify its "neutrality in the EU referendum", after the business network's boss John Longworth resigned after coming out in favour of Brexit. On the campaigning front, Leave.EU recently launched a video with the message that "only by leaving the EU can we ensure stronger trade with the rest of the world".